For a long time now, I have been wondering to myself when I will be getting married. I always knew that Lord Muruga already has selected that special someone for me but I never really knew who it was. I was so adamant that I remember telling my parents,"I will not marry anyone unless Murugan comes in my dream and tells me who to marry and gives His blessings. I will remain a bachelor for the remainder of my life until then. I do not want to end up with someone who may be greedy, materialistic, doesn't believe in God (especially Murugan) and who may jeopardize my character and bring bad name to me and my family by committing adultery after I get married. I don't want that nor do I want a divorce. With Murugan's blessings, I want a beautiful wife who has a good character and I want to have a happy family life or if my karma doesn't allow it, then I don't want a family life at all." So strong was my conviction, that I even made my mother make a promise (sathyam) to Lord Murugan not to pray for a wife for me but instead leave everything to Him. As unhappy as my mother was with this request of mine, she agreed and made the promise. Recently, I had an encounter with one of my good close friends  Sivakumaran Anna  he is a staunch Murugan devotee. Lord Murugan frequently goes in my friend's dream and gives him special messages and unique divine experiences. Some of those messages are for me, such as Murugan instructing me to do abishekam on a certain special day, etc. During the last day of Kantha Sashti (October 29  the day of anna-dhaanam or food giving to the devotees who fasted the entire previous night), Siva Kumaran Anna and I were discussing our future plans of family life. Being in my late-20s I was worried that I may not find someone. Sivakumaran Anna reassured me that Lord Murugan had found someone for me and that in due time, I will come to know. We discussed all this in front of the Aarumuga swaami statue before I went home. Before I left for home that day, however, Sivakumaran anna gave me a special gift  it was vibhuthi from the Thiruchendur Murugan Temple in India. Sivakumaran anna obtained it when he went to India in 2003 for his engagement. It was wrapped inside a beatel leaf (see picture below). You will see why this incident is important later. 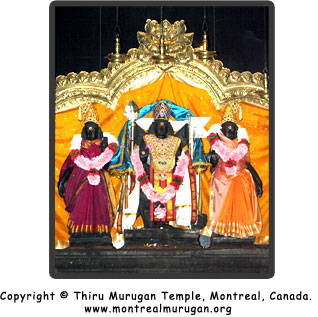 The next day was Thiru-kalyaanam of Sri Murugan and Selvi Deivayani  it was celebrated in grand style at the temple. On this day, Sivakumaran Anna runs up to me as if he was very eager to deliver some important news. He said, "Last night I had a dream. I was present at a wedding in this Thiruchendur Murugan Temple." I replied,"Oh, was it yours?" The reason I said this was because Sivakumaran Anna expressed to me earlier that he wanted to celebrate his forthcoming wedding in January 2007 in this Murugan temple. Sivakumaran anna replied,"No. It was yours!" "What! Really?" I immediately inquired in disbelief. "Yes! It was yours. You were all dressed up in traditional Indian attire and you were seated along with your family and the bride's family in front of the main Murugan statue." Sivakumaran anna explained. "Don't joke around! Are you sure? Promise? On Murugan?" I pressured him, as I couldn't believe my ears. "Yes! Promise. On Murugan!" Sivakumaran anna replied. "Did you see who the bride was? Did you get a good look at her face?" I anxiously asked, eager to know more about this mysterious person whom Murugan has chosen for me. Sivakumaran anna nodded his head. "So tell me, who is it?" I pressed on. "I will tell you at the proper time. But let me finish telling you the dream. As the wedding progressed between you and your future bride, a bright light (velicham) entered the temple. And from that light, came a figure of a young boy around the age of 7 or 8 yrs. He was wearing a shining gold colored veshti worn brahmin-style and had sparkling jewelry and was very fair and handsome looking. He was so radiant and bright that when I looked at his face it was as if I was looking into the morning sun. My eyes started to tickle (kan-kusum). He (?Murugan) then walked up to you and your bride and raised his right hand in blessings. He then disappeared and I woke up." said Sivakumaran Anna. Sivakumaran Anna didn't tell me anything further but I was so happy to hear this dream but at the same time so curious to know who the mystery girl was that Lord Murugan had selected for me! 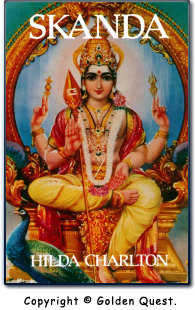 As the Thiru-Kalyaanam was celebrated in the temple, I prayed to Murugan, "Murugaa! Today (symbolically) is your wedding day and I am present standing in front of you sending my well-wishes to you and your bride. May you, on my wedding day, be present and grant me and my bride your blessings on our special day  which has yet to come. I know you have selected a very nice girl for me. I don't know who yet but you have shown Sivakumaran Anna. I hope I will be deserving of such a wonderful person you have graciously chosen for me." I said this prayer all internally, without uttering a word. Before I left the temple, an unknown devotee comes to me and speaks the following words which completely took me by surprise [in Tamil], "Today was Murugan's Thiru-kalyaanam (wedding). On the day of your Thiru-Kalyaanam, please invite us because we would like to be at your wedding. May Lord Murugan's blessings always be with you." With those words, the devotee left the temple. I was speechless with all the events that were unfolding during this evening beginning with Sivakumaran Anna's dream, then my prayer to Murugan, and now this unknown devotee speaking such important and relevant words to me. These preceding events all led me to ask Lord Murugan if all this was His leela?! That night as I sat on my bed I prayed,"Dear Lord Muruga. Can you please show me who you showed was my bride in Sivakumaran anna's dream? Can you show me also  your child? Please. Please show your child whom you have chosen. Muruhaiya, please...ennakum en pomblae-nda muham paaka asai-irukuthu aiya...ennakum katringalaa? [English meaning: I really would like to see the face of my future bride...can you please show me?]" I said this prayer while I was sitting on my bed, with my head bowed in humility. After saying this short prayer, I retired for the night. That night, I had the following dream. I was in the Thiruchendur Murugan temple standing beside the palipeedum next to (to the left of) the mayil vahana statue. Beside me was a young woman wearing a blue sari. She was Tamil but was rather tall for a Tamil girl. At least 5' 6". I didn't look at her face though. Instead, my attention was drawn to the Ganapathi mulasthaanam where a young priest in his late 20s was. He stood before Ganesha and had a flower tray (poo-thatu) in his hand. He looked quite handsome for a priest. The priest (?Murugan) was wearing a nice red veshti worn brahmin style, vibhuthi adorned-forehead, and I saw lots of jewelry and a sacred poo-nool (thread) adorning his chest. His hands were busy doing something with the flower tray. I peered closer from a distance. I couldn't believe my eyes. In the tray, was the vibhuthi that Sivakumaran anna gave me on the annadhaanam day of Kantha Sashti - wrapped in a beatle leaf! I thought to myself,"How did He (the priest) get that? Sivakumaran anna gave it to me!" 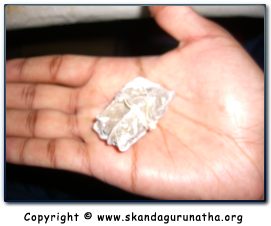 However, in my dream the priest (?Murugan) had the same vibhuthi that was wrapped in the beatel leaf on His flower tray! Then Murugan did one thing I didn't expect. He opened the beatel leaf and spread it flat on the flower tray. When he did that, I saw the white vibhuthi contained inside. He then walked my way but very slowly! His gaze met mine and He smiled at me. I, too, smiled back at Him. He then turned His gaze to the person standing beside me, as if telling me (non-verbally) to look at who was standing beside me. I turned my head to my right and I saw the face of the woman I was standing beside. I recognized her from previous visits to the Murugan temple. She was much younger than me in age. But nonetheless, I recognized who this beautiful being was  my future bride. Murugan, too, smiled at her and she smiled back at Him and me. After I had the pleasure of seeing the face of my future bride, Murugan then came over to both of us. He held out the flower tray (containing the vibhuthi) to us. I and my bride-to-be, each took the vibhuthi prasadam and smeared it on our foreheads. Murugan then put the flower tray down and took a pancha aarathi and walked over to the kodi-maram (flag post). He stood behind the altar, waved His fingers over the pancha aarathi and it miraculously lit up. He then began waving the camphor-lit pancha aarathi very slowly. He did it in an oval-shape manner from holding the aarathi very high and then bent down very low (?probably to do aarathi also to the little Ganesha seated at the base of the kOdi maram). My bride and I didn't even look at the main mulasthaanam instead our gaze was permanently fixed on Murugan. He, however, had a neutral expressionless face that was focussed on the main mulasthaanam statue of Lord Murugan. The priest (?Murugan) continued unabated with His aarathi. He did it about 5 or 6 times. After He finished, He placed the pancha aarathi on the kOdi maram and disappeared into thin air, while the camphor-lit pancha aarathi continued to burn. Both myself and my future wife could not believe our eyes as we both saw the priest disappear. It was then when I awoke. I was soooooooo ecstatic when I awoke because of the love Lord Murugan showed me. How quickly He answered my prayer! How He showed me the beautiful child that He has chosen for me to marry! How kind you are my loving Lord! How can I ever thank you for the unconditional love you continue to show me? You truly do treat me like your child! How blessed am I to receive your grace! Thank you sooooooooo much Muruga! Words will never ever capture how much you mean to me. May I always continue to think of your feet, sing to your feet, serve your feet, and one day attain your fragrant divine lotus feet. The following week, I asked Sivakumaran anna to describe the person I was to marry  the one whom Murugan showed him in his dream. He replied,"She comes to this temple with her mother. She has an uncle and aunt who have one very young son. She also has two older brothers." Sivakumaran anna continued. And as he was describing all this to me, he paused, as he looked behind me. I turned around to see what he was looking at and I saw the person whom Sivakumaran anna was just describing enter the temple! The same person I saw in my dream! I couldn't believe the impeccable timing of this incident. I asked Sivakumaran anna, "Is that the girl you saw in your dream?" He replied, "Yes. How do you know?" I said, "Because Murugan showed me." So the identities of the two people whom I saw and Sivakumaran anna saw were confirmed  it was her  my future bride, a gift from my beloved Lord Murugaa. The following night, I had another dream as if Lord Murugan wanted to dispel any doubts I may have had from the previous night's experience. In this dream, I was in the Thiruchendur Murugan temple and I was carrying the eluntha-aruli vigraham situated in the vasantha-mandapam along with three other male devotees. I was situated at the front right carrying Lord Murugan on my shoulders. In front of us, was an individual I recognized immediately. It was my future-bride whom I saw in my previous night's experience. She was waving the saamarai and proceeding in front of us. I was happy to see her. We proceeded to carry Lord Murugan around the mulasthaanam and stopped in front of the Aarumuga swaami statue  where Sivakumaran anna and I originally had our discussion regarding marriage on the anna-dhaanam day of Kanthar Sashti! What a great experience and blessing my beloved Lord Skanda had shown! I am eternally grateful and humbled by His show of love and concern with my life's affairs! Thank you my dear dear Bhagavan Sri Skanda. Yesterday following Ganesh Chathurthi, I was concerned about my career (which had yet to start) and my marriage to this special person whom Murugan had shown to me in my dreams the previous few nights [Read experience above]. With this worry, I went home and slept. That night, I had a very short dream with Murugan (in Sivakumaran anna's form). "Nee ondum kavalai pada vendaam...naan ellaam pathikkren." [English meaning: "You don't worry about anything, I'm watching over everything (in your life)." "I was in Nalloor Murugan temple in Jaffna, Sri Lanka. There was a Thiru-Villa in progress. I saw you and my uncle carrying my Murugan while I was standing in front of you with a thiru-villaku (lamp) in my hand. I was wearing a kun-kumum pottu on my forehead [indicative of a married person]! We carried Murugan around the temple and after the temple festivities finished, the Iyer came and gave me and you vibhuthi. You were standing right beside me and prostrated at the Iyer's feet to do paathanamaskaram. He then gave us both vibhuthi and said, [in Tamil] "Neengal irandum ennakum en adiyaargalkum thondar seya pirappu eduthu-ningal...appOthu neegal irandum eppOvum nalla iruppingal. 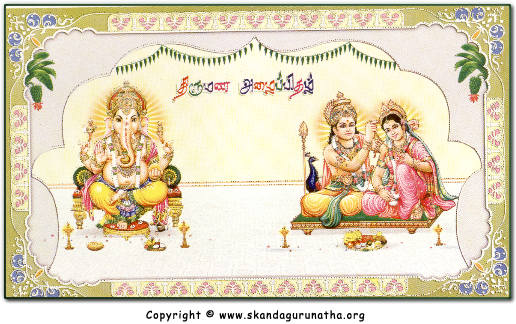 [English meaning: "You both have taken birth to serve me and my devotees. And because of that you two will always live well."] He then tapped me on my head with his hand in blessing. As we were leaving, my mother said, "[my name] - let's go! Tell [your name] to hurry up." "Why did my mother say that? Does that mean you are going to live with us in future? Why was I wearing the kunkumapottu on my forehead? Does that mean we are to be married? What was I doing in the dream with you by my side? Why was my mother calling your name? She doesn't even know your name in real life! Was Murugan talking through that priest?" I was in disbelief upon hearing this dream from this beautiful girl who stood before me. I was overwhelmed with emotion and was so thankful to Lord Murugan for orchestrating all this during the days following Kanthar Sashti. How can this be a coincidence? Lord Murugan going into three unrelated people's dreams and telling them the same thing  His will and desire to see His children  married. In Sivakumaran Anna's dream, He came and gave His full blessings at the wedding in progress. In my dream, He came and gave us vibhuthi blessings. In Mathuri's dream, He came and told us what He wanted us to do after we were married. What three wonderful experiences Lord Murugan has allowed us to recount and experience! I am truly speechless at His gracious and kind act of love He has shown to me, my future-bride-to-be, and my future in-laws! Thank you my dear Bhagavan Sri Skanda. May you always continue to guide and bless us so that one day we attain your fragrant divine lotus feet. Last night, I dreamt that I was seated at the Thiruchendur Murugan Temple with my future-bride beside me on my right. We were seated in front of the kodi-maram (flag post) directly facing the main Murugan mulasthaanam. The priest was seated on my left while chanting mantras. I remember feeling the heat and seeing the large orange flame of the yagna in progress. Then the priest asked me to extend my right hand as did my future bride. He then tied a yellow-brown color thread around my wrist and that of my future bride. That is all I could remember before I awoke. I later told this dream to my mother who explained that the procedure that took place is what occurs during a marriage ceremony. I was so happy to hear this and know that everything will happen as per Lord Murugan's will in the near future. I still can't believe all of this happening during these last few days of Kanthar Sashti! Thank you my beloved Bhagavan Sri Skanda for all these blessings. I am truly fortunate to receive your grace! Last night, I dreamt that I was in the Thiruchendur Murugan Temple. I was standing looking at the eluntha-aruli (gold-colored) vigraham of my beloved Murugan. He was situated to the left of the kodi-maram (flag post). The priest was standing beside him. As I was lovingly gazing upon Bhagavan Sri Skanda's beautiful form, the priest beckoned me to come forth. I walked upto him and waited for an instruction. The priest said [in Tamil],"Murugan doesn't have a lamp in front of him. Go and get a lamp for him and put it here." I then proceeded to pick up a lit Thiru-villaku lamp and placed it beside Murugan. I then awoke. Thank you Muruga for showing me such auspicious signs, such as lighting this lamp. I love you so much! "Before I even look at these two horoscopes, I can already see there is a divine calling of these two people together...This boy will always be attached to God...She is the embodiment of Lakshmi and She will give Him a lot of happiness...they will both be very happy together...Amma...in all my years as an astrologer, I have never seen such good 'poruththam' (compatibility) between two unknown people's horoscopes...how did you bring these two people to come together like this? These two people are truly blessed...there is something divine about this pairing...I can feel/sense it." My future bride's mother could not utter a single word except show a smile of gratitude to Lord Murugan. I initially was disappointed that my future bride's mother didn't show her trust in Lord Murugan's leela, but couldn't help but be amused by what the astrologer told her. Of course there is good compatibility between us two  Lord Murugan willed for the two of us to be together without looking at any horoscope!!! God doesn't need to do that. Whatever He wills, happens and always is for our benefit & ultimate good. Last night, I dreamt that I was in a temple filled with devotees. There were so many that I saw, including one devotee who was seated on the temple floor practicing pranayama. My attention was then drawn to the main sanctum sanctorum where stood a towering (at least 6ft) gold-colored statue of Bhagavan Sri Skanda in his aarumuga form (six-faces). My eyes feasted on this wondrous sight. Then one devotee pointed at me to follow the priest. He said,"Go and hold the umbrella over the kumbam that the priest is carrying." I did as I was told. The priest carried the mantra-charged water-filled kumbum around the main sanctum sanctorum and then poured it on the gold-colored aarumuga vigraham (six-faced statue of Lord Skanda). I then ran to collect the theerthum (blessed holy water) that flowed from the statue into the drain. I recall drinking the theerthum. The priest also poured milk on Bhagavan Skanda and I, too, drank the divine blessed milk theerthum to my pleasure. It was such a wonderful experience. Thank you my dearest Lord Shanmuga (six-faced form of muruga) for your continued blessings which you graciously shower on us. You keep showing such auspicious signs leading up to our forthcoming marriage. We love you and all that you do! Here are the original wedding invitations for our wedding. 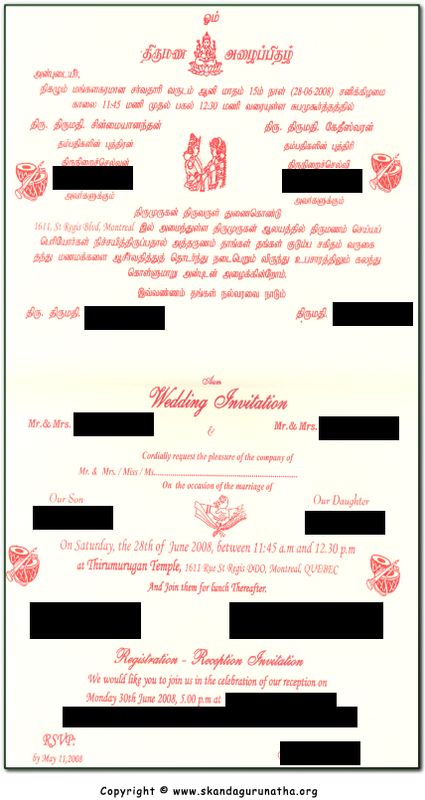 If you note, we specifically chose Lord Murugan to be on the cover of our invitation because it was Him who brought us two together. 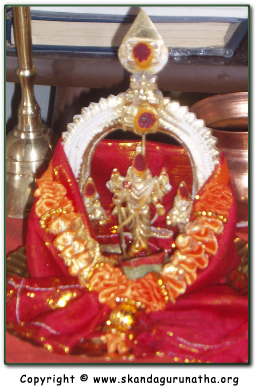 The wedding proceeded by Lord Skanda's grace on June 28th, 2008 at His sacred temple. My wife and I sang in front of all who gathered for our wedding, "Thirukalumam pathigam" (Thevaaram by Thiru-Nyaana-Sambanthar) and "Naatha Vinthu..." (Thiruppugal by Sri Arunagirinathar) to request God's blessings for a good married life. We gave full credit to our SatGuru - Lord Muruga - and told everyone that it was because of Him that the two of us are wedding today. To put the "icing on the cake," Lord Murugan did one other miracle. After the ceremony ended, and everyone was eating, the priest privately called my wife and myself. He took us to the main Murugan mulasthaanam and said [in Tamil but paraphrased into English],"We had this statue for the kumba-abishekam that was done recently. It has been especially blessed (being placed in front of the main murthi - see picture on left)." He added, "This vigraham (statue) & yantra is given to only to a few special people and you, two, are one of those people. Here take hold of it." My wife and I were so surprised and overwhelmed by this because we never expected it. We both did paathanamaskar to the priest (?Murugan) through whom Lord Muruga was blessing us. 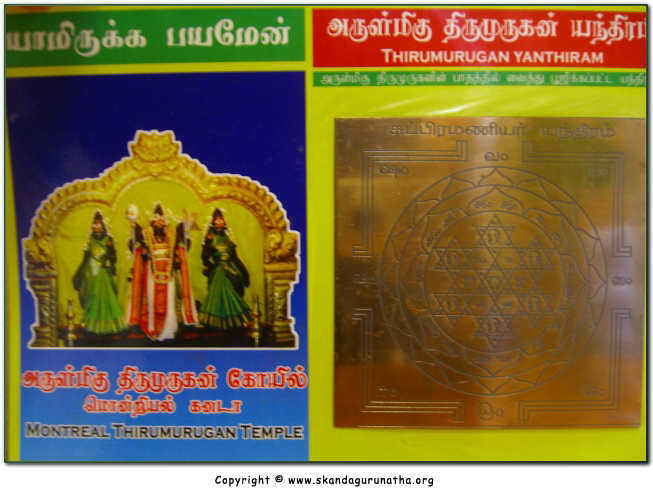 We graciously and joyfully accepted the precious gift that consisted of Lord Murugan with Sri Valli and Deivayaanai statue and also a Subrahmanya Yantra (see below). Mind you at this time we did not know how to do an official puja to Lord Muruga - to read about how Lord Muruga kindly and graciously blessed us to do puja for Him (which we now do daily for this statue/murthi & yantram) - see: Darshan - Puja: How to Perform Skanda Puja. What can we say about His Grace? What can we say about His kindness? What can we say about His Love? With all our hearts filled with love, gratitude, and immense faith only can we show our thanks. May we always melt and bask in the bliss that is invoked when we chant Your beautiful Name. We love you Muruga!